We manufacture only the finest quality professional hair cutting scissors and hair shears. All ToullGo Shears include one year warranty. These high quality shears are made of forged Japanese 440C stainless steel and built to last a lifetime while giving the same razor sharp cuts since first use. As a hairstylist, hair scissors and hair shears are some of the most important and expensive pieces of equipment you own. Join thousands of hairstylists and purchase with confidence! We are dedicated to your satisfaction!!! 100% Stainless Steel for durability. ToullGo Professional Haircutting Scissors are manufactured with high quality Stainless Steel for durability and longevity. They are very stylish and sleek looking. Adjustable tension knobs and removable finger insets make these shears customizable to any hand. The 6" shears come with very sharp blades and the grip is comfortable for any size. This kit comes with zippered cushioned black leather storage case with elastic bands to keep the scissors in place and prevent accidents. 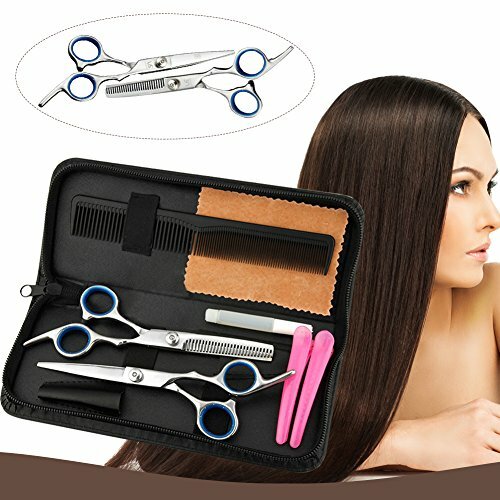 Package included: 1 x regular hair scissors; 1 x thinning scissors; 1 x grooming comb, 1*leather cleaning cloth, 2 x hair clips, comes with a leather case for safety storage. If you have any questions about this product by TOULLGO, contact us by completing and submitting the form below. If you are looking for a specif part number, please include it with your message.